There are number of temples on the bank of the Ganga river in Varanasi. 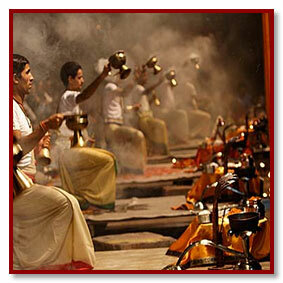 It is believed that people are cleansed physically, mentally and spiritually at Ganga Ghats. It is at the Ganga Ghats where we see life and death together. For thousands of years people have been thronging these Ghats to offer their morning prayers to the rising sun. There are more than 100 ghats along side Ganga in Varanasi. Some of the rominent and popular Ghats at Varanasi are the Dasaswamedh Ghat, Manikarnika Ghat, Harischandra Ghat, Kabir Ghat and Assi Ghat.